Glen Upshaw received the Oakland Citizen Humanitarian Award for his outstanding work on behalf of the community on Sunday, January 15, 2017. Glen Upshaw has worked in the field of street outreach and violence interruption for five years. He started his work as a street outreach worker, violence interrupter, and Area Team Lead for Oakland California Youth Outreach. The work came naturally to him with his credibility on the streets of Oakland and his commitment to resolving conflicts peacefully. In 2016, Glen joined Youth ALIVE! as a Violence Interrupter. His role as a Violence Interrupter involves deescalating situations before violence occurs or restoring peace and safety in situations where violence has taken place, often a shooting or death. He also spends time in Highland Hospital visiting victims of gun violence, supporting victims and their families, and spreading the message that there are alternatives to violence. 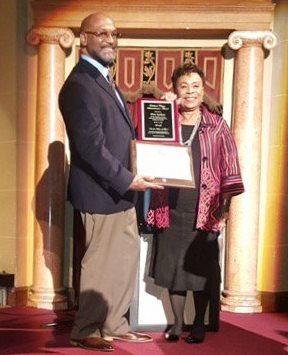 Glen Upshaw receives Oakland Citizen Humanitarian Award from Barbara Lee.